Humanity is a migrant species and every nation’s founding story has this element in its telling. 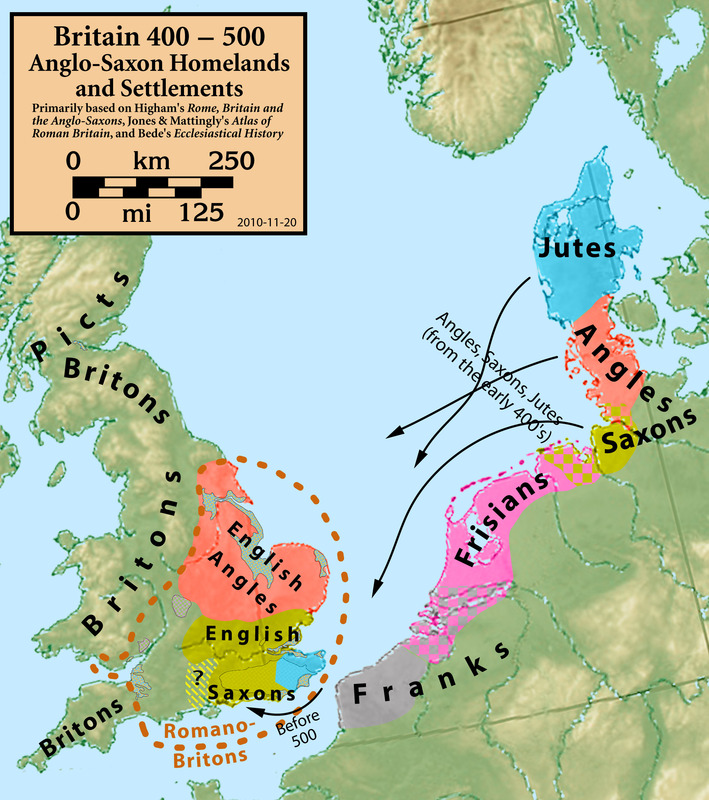 There is still much debate about the Anglo-Saxon settlement in Britain, some say that there were already proto-English on the Saxon Shore in Roman times, employed as part of its coastal defences. And all over the Empire, friendly tribal forces – known as foederati – were used as auxiliary soldiers and allowed resident status within its borders. Come the great Brexit from Rome, this tradition was continued by a British ruler who, to fill the gap left by the departed legions, invited Germanic mercenaries to help with the defence against marauding Picts and Scots. ‘Like wolves into the sheepfold’, laments the Sixth Century historian Gildas for soon the treacherous foederati began to carve out the home counties for themselves. Borges, in his characteristic succinctness, concludes that this brutal adventure will unknowingly lead to Shakespeare, Whitman and the very poem he is writing. Bede gives more detail of what he calls the Adventus Saxonum or ‘Coming of the English’, and he dates the event to 449 AD. According to him, the British leader was Vortigern, who would pass into Welsh folklore, and the foederati were Jutes, from Jutland, led by two brothers Hengist and Horsa. Like Romulus and Remus, that traditional archetype of twins in a foundation myth is present here. Indeed, Bede is keen to point out that they could trace their lineage back to Woden, that great Norse god we still celebrate every Wednesday. But the Anglo-Saxon scholar JRR Tolkein was convinced that Hengist was a real person. In his analysis of that Scandi-noir classic Beowulf he picks him out from the ‘Finnsburgh Fragment’ of the poem that details a turf war in Fifth Century Denmark. Hengist is described here as a wrecca, Old English for ‘exile’ or ‘adventurer’, and Tolkein interprets his role as leading a war-band of Jutes acting as mercenaries. Perhaps this led to Hengist and his gang becoming economic migrants and heading to Britain to work as foederati there. The Argentine writer Jorge Luis Borges (who made some study of Anglo-Saxon himself) describes this journey in his 1973 poem ‘Hengist Wants Men (449 AD)’. Gathering warriors from wetlands and forests Hengist ‘wants them to subdue an island that is not yet called England’ and Borges, in his characteristic succinctness, concludes that this brutal adventure will unknowingly lead to Shakespeare, Whitman and the very poem he is writing. English culture has its roots in our primal identity as foederati, that strategy of holding an empire together by foedus, meaning ‘treaty’ or ‘agreement’. And this is where we get the word ‘federal’ – a term that strikes terror in many a Brexiteer or supposed English nationalist. Misguided by the myths of our own empire they imagine that federalism means subjugation. If they were to follow the example of the prototype Englishman, the wrecca Hengist, they might just realise that it could be the best way of getting what you want. Of course the opposite of foedus is, quite simply and literally, ‘no deal’. And we all know where that might lead.